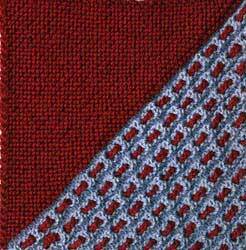 I used approximately 25gm each of unknown brand red and light blue 8ply (DK) wool. Repeat these 6 rows 10 times (60 rows). Change colour and decrease as follows: K2tog, K to end. Continue until you have 2 sts left, cast off and block. Crochet a chain long enough to thread through the next row of eyelets, (Begin with the longest row). Weave the cord through the eyelets, alternating the way you thread in each row, to form a brick design (as in the image above). When you have woven all the cords, secure them at the back of the square by sewing in the loose yarn at the ends in the same manner as you would when sewing in any loose ends on your knitting.